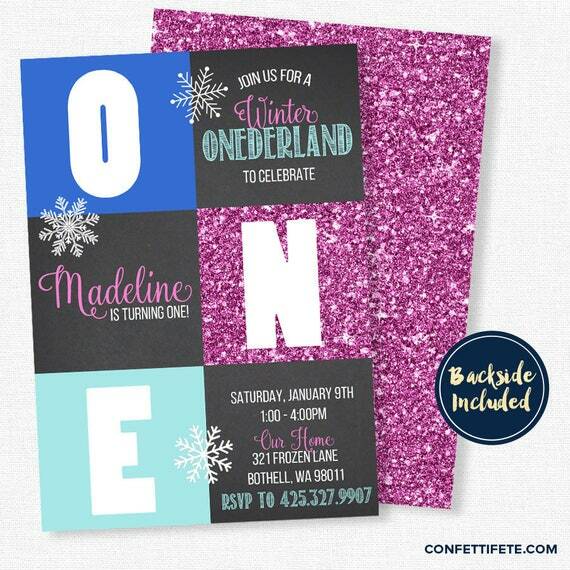 Celebrate with this snowflake birthday invitation. Designed in blue, aqua, pink and purple with a chalkboard background. Customized to work for any age. This double-sided, snowflake birthday invitation is available professionally printed or as a digital file. Please choose above, from the drop down menu, digital or printed and quantity. All printed invitations measure 5x7 and fit an A7 envelope. Digital invitations are available in sizes 4x6 or 5x7. Your final order price will be applied, once you have chosen. For photo invitations please send a full size, high-resolution photo file to hello [!at] confettifete.com and include your order number with the email. By sending the photo you agree that you have exclusive rights to use it. PRINTED INVITATIONS - Your order includes double-sided invitations, white envelopes and shipping with tracking. Invitations are professionally printed on premium white, 130lb smooth cardstock which gives them a beautiful finish. *Colored envelopes are available - sold separately. DIGITAL INVITATIONS - Your order will include (2) digital invitation files (front + back) in high resolution sent to you via email, within 2 business days, as a JPEG or PDF attachment. Please note you will not receive any printed items. You can use this file to print from home, send to a local printer or email guests. When sending to a local printer I always recommend having a test print done before placing the full order. Every printer is collaborated slightly different. If you need your file sooner, sameday, please choose the RUSH option for digital files, in the drop down menu. Your order will be sent to you within 2 hours during open office hours or sameday if during the weekend. If you have any questions please convo me. I look forward to working together! Please note: Colors may vary between your monitor and final printed product. This item is for PERSONAL USE ONLY. You are not allowed to share, copy, sell or edit in any way.